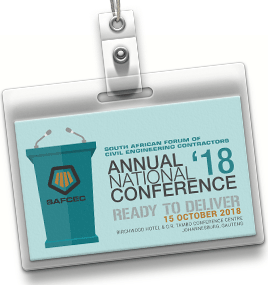 The SAFCEC Annual National Conference takes place on Monday, 15 October 2018 at the Birchwood Hotel and O.R. Tambo Conference Centre in Johannesburg, Gauteng. The programme will once again include our SAFCEC Annual National Golf Day on Sunday, 14 October 2018, and the SAFCEC Annual Presidential Gala Dinner on the evening of the 15th October 2018. REGISTER TWO DELEGATES FOR THE PRICE OF ONE! LIMITED TIME OFFER!